I was absolutely elated yesterday to get my copy of the newly published “Letters and Papers from Prison” (Vol. 8 in the Dietrich Bonhoeffer Works). This is the volume wherein Bonhoeffer (I believe) has been most misunderstood and misrepresented (though some would certainly disagree with my conclusions). His notion of “religionless Christianity” deserves a careful consideration and not a knee-jerk reaction as is so often the case. 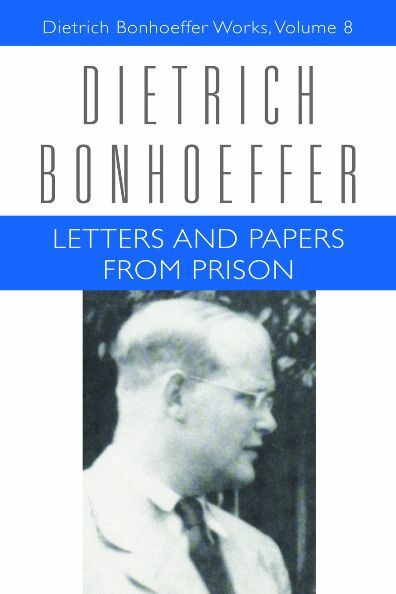 I would encourage anyone interested in (the later…more controversial) Bonhoeffer to find a copy and read it thoroughly. Thanks for these links. I wish I had time to work through Bonhoeffer's corpus. I've read Cost of Discipleship, and it looks like "vol 8" would be a good launching off point into the rest of his thought. Che,Part of the difficulty in vol. 8 (Letters and Papers) is that it is some of the last of his writings and so a number of things are sketched rather than complete. It also includes many personal letters, some poetry and other personal things. It (along with some of the other works in the series) contains much that is insightful about his life and times, but perhaps one would do better first reading some of his other works like "Christ the Center" or "Life Together" (since you've already read his "Discipleship"). Those would probably also contribute much towards a better understanding of what follows in his later writings (though I would by no means dissuade you from reading Letters and Papers from Prison…which is still a wonderful work including much that was lacking in the earlier mass market editions prior to this critical edition series that includes much in the intro material and footnoting as well). I do hope you in fact read much more of Bonhoeffer and find his ministry to be as much a blessing to your life and faith as it has been to mine. Richest blessings to you! Rick, Thanks for the great follow up! I'll keep your reflection here in mind as I look through his "letters and papers." Next Next post: Ezekiel 19:1-20:44 – An Inevitable End?